The average person will walk 150,000 miles in their lifetime. That’s the equivalent of walking around the earth six times. So, an important question becomes: When is the last time you thought about proper footwear and the health of your feet as the key to your overall physical and mental health? It may seem like a strange question but think about what your life would be like if you could only walk or stand for short periods of time without pain. Limited mobility would affect your independence by impeding your physical activities and curtailing your social life. Unfortunately, it happens every day. We are constantly bombarded with messages about our blood pressure, cholesterol levels, the importance of a healthy diet and even how to feed our brains to ward off dementia, but we rarely get messages about foot health. The foot is a biomedical marvel with 26 bones and 33 joints, working together to provide balance, stability, and locomotion. Today, start thinking about the shoes that you wear as shock absorbers, much like the shocks on your car. Footwear is your first line of defense against the wear and tear of an active lifelong lifestyle. Proper footwear provides not only protection, but helps you maintain your balance and posture and prevent falls. They also help prevent conditions such as bunions, plantar fasciitis and calluses. A good pair of shoes or sneakers helps reduce the impact of your step, which is 1.5 times your body weight if you are walking and 7.9 times your body weight if you are running. What Does Proper Footwear Feel Like? That depends on what you are doing. Footwear has come a long way over the last twenty years. You can now buy shoes tailored to specific activities such as running, walking or tennis. The rule of thumb is that if you are doing the same kind of exercise three times a week, then buy the shoe for that exercise. A great shoe will fit you properly and be comfortable to wear. It will have good arch support and leave enough room for you to move your toes. The rule of thumb here is to bend the shoe to make sure that it is not too flexible, because that indicates a lack of support. You should also never buy a pair of shoes that feel uncomfortable in the store. The old wives’ tale that you “can break them in” has led to much misery and unworn shoes! If you have fallen arches, high arches or plantar fasciitis, you should be fitted for orthotics by a physician. The consensus for orthotics is that if you have constant foot, hip or knee pain, custom orthotics may be necessary. 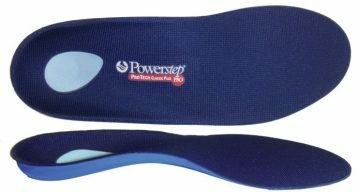 If orthotics are not available to you, try a podiatry approved insert like Powersteps as a good alternative. With or without orthotics, it’s important to replace old shoes every four to five months. Check the midsole of the shoe because it shows damage sooner than the bottom tread. Even if you’re not an athlete it’s important to make sure that you make proper footwear a part of your wardrobe. Invest in good quality shoes, there are many styles, aside from athletic shoes, on the market today. Form has in fact caught up with function. It used to be rare to be able to find built in arch support in dress or casual shoes. However that is an option now in many brands of shoes. It’s helpful to stick with brands that you know work for you. Remember those gym classes in junior high and high school? Back in the day, a gym teacher was always a pumped-up fitness jock who took themselves and exercise very seriously. You, on the other hand, were just there to hang out with friends and hopefully, not be chosen last for any of the teams. Surprisingly, it was probably there that you developed a lifelong flirtation with exercise. One thing we weren’t taught in those classes is the importance of stretching for healthy feet. 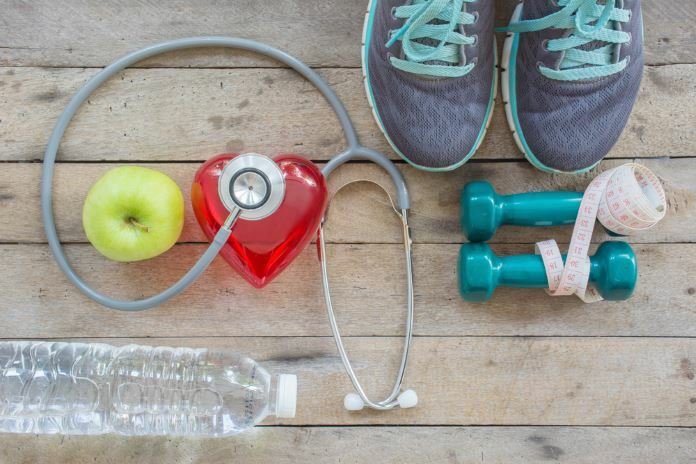 For athletes and moderate exercisers alike, (even if you just walk a mile a day), the benefits of moving provide a big payoff in the health lottery. Yet to keep mobility, you must be mindful of how you treat your feet, and prepare them a lifetime of movement. One of the most overlooked benefits of stretching is foot health. We demand a lot from our feet and use them extensively every single day. According to the College of Podiatry, “a person will walk an estimated 150,000 miles in their lifetime“, roughly the equivalent of walking around the world six times! All that stress of carrying you around takes its toll and puts your feet at special risk for injuries or inflammation. Thus the importance of stretching for healthy feet. Some common foot problems are Plantar Fasciitis, Achilles Tendonitis, Posterior Tibial Tendonitis and many others. Improper footwear is also a big culprit in foot problems and pain. Most foot exercises are simple and easy to do and increase the range of motion in the feet. They say that “age makes us all equal” and that is nowhere truer than foot health. The feet are a marvel and contain 26 bones, 42 muscles, 33 joints and 50 ligaments and when healthy, work like a well-oiled machine to get you where you are going. Exercise philosophy has come a long way, and we now understand that stretching is an important part of any exercise or rehabilitation program. The “warm up” as stretching is known, keeps the muscles flexible, healthy, and strong and we need that to maintain a range of motion in our joints. If we don’t stretch our muscles shorten and become tight and when that happens, one wrong move can spell trouble. 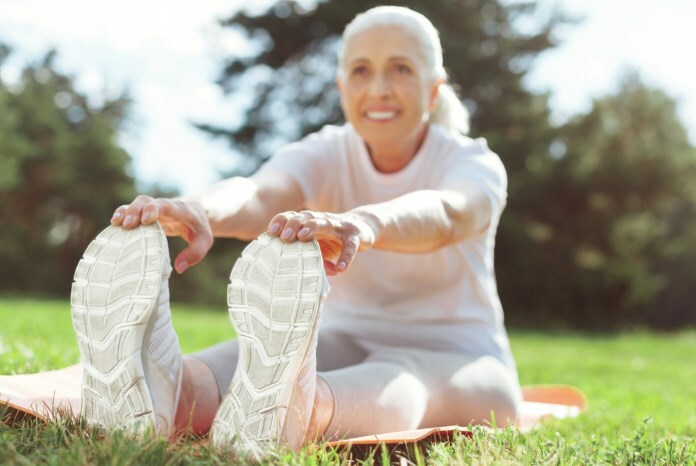 As we age, this flexibility can be the difference between an active or inactive daily lifestyle. Flexible muscles help you bend down to pick up that package, play with your grandchildren, or catch your dog as it runs away from you. Stretching improves circulation and increases blood flow to your muscles. It also improves posture by keeping your muscles loose, and good posture is important in keeping aches and pain away and preventing falls as you get older.